Indian classical music is second to none, says the singer, who performed in Richmond on March 20. Kavita Krishnamurthy (center) performing in Richmond on March 20, 2016. Her son Ambi Subramaniam is on violin on the right. 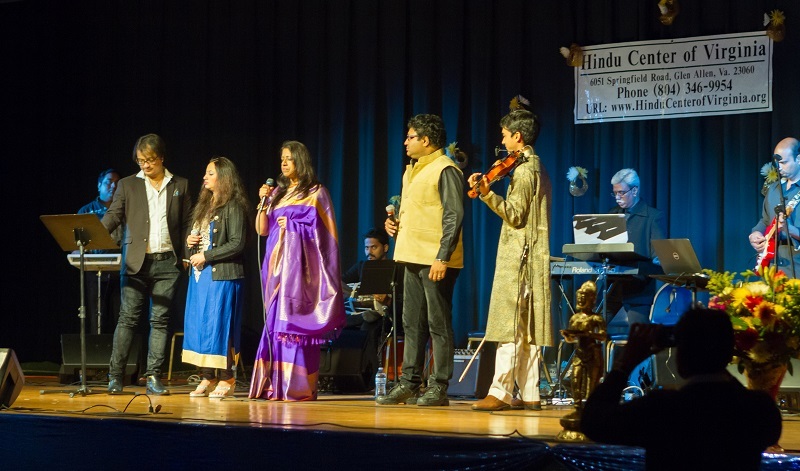 RICHMOND, VA: Indian playback singer Kavita Krishnamurthy was in Richmond, where she performed at the Cultural Center of India on March 20 in a fundraising event for the Hindu Center of Virginia. A classically trained musician, she has sung hundreds of songs in different Indian languages, including Hindi, Kannada and Tamil. Notable movies she sang include Kabhi Khushi Kabhie Gham, Devdas and Kuch Kuch Hota Hai. Krishnamurthy is married to violin maestro L. Subramaniam. 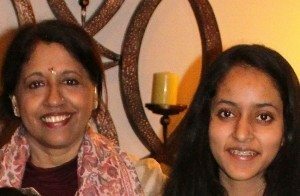 Here are excerpts of her interview with Esha Mittal. You have been part of Bollywood for more than three decades now. What is the reason behind you longevity? I do know that I got into Bollywood for my love of music, and that I felt I was there for three decades because work kept coming to me. First, I started off with doing a lot of jingles, then doing a lot of non-Bollywood films, and then Bollywood films started. I used to do two songs a day, then three songs a day. Sometimes, even four songs a day. This continued on for 30 years. I loved it so much, I didn’t want to change anything, I guess. Hindi film music has evolved a lot since you first started singing. Melody seems to have made a comeback. What’s your take on that? Well, I’ve always felt that as far as Indian audiences are concerned, the efforts are with melody. So, I’ve always felt convinced that melody must stay. It cannot be kicked out for too long, you know. Till now, we have had some good singers and good songs. I still wish that the lyrics were a little better, though. But when it comes to tune, some people are composing well and the songs make sense. It’s a good thing, and I would feel more if it does come back because we are the kind of people who love melody. We are not very, very noisy people. Once in a while, I guess, it is okay but, also, I think the songs that have stayed in the minds of the people have been the gentler songs. I think it’s a very good thing because these shows are showing our country’s talent. I’m very happy. See, India is a large country with a lot of talent and it’s only fair that everybody should get a chance. And I’m glad if these young children sing well and they get noticed. These reality shows provide lots of employment for a lot of people: the people working in the reality show, the channels making money, then these young singers who are coming. Sometimes, even if they do not win the competition, in their own areas, they become well known and start getting their own shows. Some of them are very, very poor children who come from very poor backgrounds. Because of this, they start making some money, and making a name for themselves. If they come through, the get a little stronger which I always think is a good thing. Some of them even get fame. It’s a different thing, I feel, if they continue learning music and don’t get satisfied with the numerous awards that they get. They start getting work, start getting recognized, and they start doing music which is always such a fulfilling profession for anybody. You have consistently mentioned how much you love classical music. After all, you are trained in it. How important is it to be rooted in classical music to succeed in the Indian film industry? From the way that I have grown up, I have felt that without the basic learning, at least some type of basic learning in classical music, it is difficult to remain a musician for many years. This is because classical music also teaches how to keep your voice healthy, how to do the necessary vocal exercises, similar to yoga or training for a film actor: the training to keep your body going. We need to do these things to keep our voice healthy, to be able to breathe well, to be able to keep our voice stable, and keep the voice range going for many years. All this will come only if you learn classical music. If you don’t even know what “Sa Re Ga Ma Pa Dha Ni Sa” is or what a basic raaga is, then how are you going to do those things? So, I feel that a base in Indian classical music is very important. The more knowledge you get and the more knowledge you learn is for the better. Knowledge can never be a negative thing. It can only bring positivity in your life. So, the more knowledge you gain about classical music, the more and more you get into it, automatically your singing will get a little more, shall I say, technically better, and also evolve you more as a musician. Do you feel the same way about classical dancing? Yes, for everything, even for Bollywood dancing. Bollywood dancing is okay, but if you just spend your life doing only Bollywood dancing, I don’t know whether you sustain for twenty or thirty years. The moment you learn, let’s say, Bharatnatyam, Kathak, or any other classical dance, I mean seriously; you do that and then do Bollywood dancing and after that, there is a difference. Look at our older films. We had people such as Vijyanthimala, Waheeda Rehman, and even Hema Malini. All these great actresses learned classical dancing first and then did Bollywood. There was a certain technique, a certain grace that the body had. Even Madhuri Dixit has learned Kathak very, very well. Because of this, their body movements are more fluid, I believe. You may be very good only doing only Bollywood dancing, but somehow I feel like they are doing exercise, you know. The great movement that separates and exercise from a dance won’t happen, according to me. How’s it like living with a legend, violin maestro L. Subramaniam? My husband has always been a source of great encouragement to me. Because he teaches classical music, every time he sits down to do his violin classical music, it’s like an extra dose of vitamin injection for me. When he thinks intellectually about music, it influences me also. Then, we share. Music has always been a great source of bonding for our marriage, between my children, my husband, and I. Because of my love for classical music, I have had a great bond with him. Your son, Ambi, is also a top talent. How’s it like sharing a stage with him? Oh, it’s wonderful, and when people applaud him like they did in Richmond or when everybody comes and tells me that he is awfully talented, I really feel very proud of him. At the same time, I want him to remain humble and I want him to walk the path of music with a great amount of dedication so that he can go ahead and ahead and ahead, finally reaching a point where music becomes a spiritual experience for him like it does for my husband. Your home must be filled with music! Can you comment on this? She: Of course, there is Ambi. My other son, Narayana, is a surgeon, but he likes to sing Hindi songs. So, sometimes, he comes with me on stage whenever he is free even though he is very busy being a surgeon now. Still, he loves music and like to sing. My eldest daughter has done law, but she is also a singer/songwriter in English. She writes beautiful songs, and she and Ambi have formed their own band together. So, when she comes out of her room with beautiful lyrics and a very nice song, I feel very proud of her too. So, it’s nice have all of my three children musically involved because I feel that is what will sustain in all of their lives, you know, because music can be a great friend. I feel very proud, you know. I’ll tell you the great heritage about classical music and I don’t think that it is second to anything. I feel our Indian classical traditions are equally as great if not greater because of its improvisational techniques. Any classical Indian musician can stand on an international stage and hold their own. Let’s say my husband, Zakir Hussain, all of them, can collaborate with anyone. They can come up on stage without knowing what the others are playing, listen for ten minutes, and start playing that same song at an equal level. This is because classical music is so powerful and the improvisational techniques are so powerful that you can go up on stage with any person from any part of the world. That’s why I feel proud that these are Indians who have made such a great mark for themselves. I’m hoping that they are iconic and will show the path for the other younger musicians, helping more and more new musicians to get more internationally known. I’m happy because that’s the spread of Indian culture and music, and we want the whole world to know what a wonderful country we have. Bollywood music has become popular in the United States in the past couple of decades. People here now get to hear and watch the new songs almost at the same time they are released in India. You have been performing in this country for a number of years. Is there any difference in the kind of reception you get now? First, I’m happy to hear that. I’m glad to know that Bollywood music is popular in the U.S. I’m happy to know that the Indians, the Whites, the Blacks, the Hispanics are all listening to that popular Bollywood tune. As far as the reception goes, no, I’ve always felt that from the time I first came to the U.S., people love me sincere and that they’ve always given me a warm welcome. It’s always been wonderful to perform for audiences here in the U.S.
Can you describe your experience and the reception you have received here in Richmond, Virginia? Well, I’m so happy that after so many years of my life, after forty years of being in music, I came to Richmond. Everyone was so wonderful to me. I met so many amazing people. Going to the temple was also wonderful. I hadn’t known that when the old temple was built, sometime in the 1980’s, my husband had performed there. Now, for Hindu Center of Virginia, I have performed. It’s a wonderful feeling. The temple was so beautiful. I was welcomed by a wonderful community. Richmond is very, very pretty, beautiful, open, and scenic. I would definitely like to come back.